Satellites' Scope And The Search For A Plane : The Two-Way Satellites have focused the search for Malaysia Airlines Flight 370 on the southern Indian Ocean. But without results yet, the effort also highlights the technology's limitations. 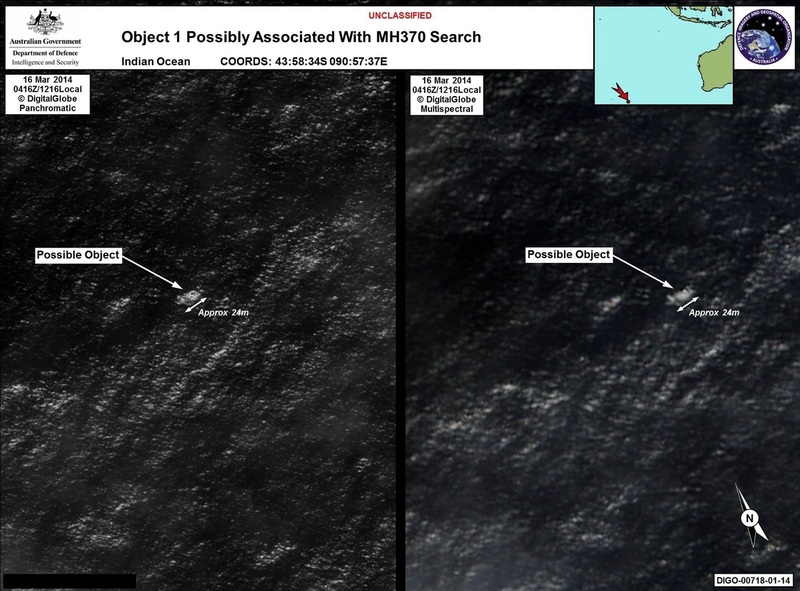 Satellite imagery provided to the Australian Maritime Safety Authority of objects that may be possible debris of the missing Malaysia Airlines Flight MH370. The search for Malaysia Airlines Flight 370 is now concentrated in the southern Indian Ocean, with satellite clues bringing aircraft and ships closer to objects that could be the debris from the missing airliner. But as NPR's Robert Siegel said on All Things Considered Friday, "This is not like finding a needle in a haystack. In this case, the haystack is vast and the needle could be moving." John Young of the Australian Maritime Safety Authority said Friday the tactic had moved from radar to visual, with trained observers scanning the ocean from low-flying aircraft. Saturday's search will follow the same technique, he said. But satellites aren't out of the game: "We will be looking to see if we can acquire more satellite imagery that would provide us with new or refined information. I don't know what that might be," he said. DigitalGlobe is now crowdsourcing for further clues that may be hidden in its high-resolution satellite imagery. The need for crowdsourcing "speaks to the fact that high-resolution imagery doesn't offer wide enough coverage," says Defense One, reporting on U.S. investment in satellite technology. "While today's high-resolution image satellites can take very detailed pictures of relatively small areas," Defense One reports, "old-fashioned radar satellites are the best solution for finding lost objects at sea, says Kurt Schwoppe, manager for imagery solutions for the company Esri." As The Washington Post reports, the search for the Malaysian airliner "has exposed the technological limits of satellites" more generally. "These limits are shaped by physics, money and practicality," the paper says. There's a trade-off in the technology, the Post says: "You can go wide or you can go deep, but you can't do both. The most sophisticated spy satellites are essentially looking down straws, trying to resolve small details in a narrow field of view." To get a broader view of the search area for yourself, you can check out Reuters' interactives, which show what's known about the flight's path and where crews are looking.